It's been some time now since I've tried to sprout an apple seed (about 21 years). The last time I did so, we decided to go camping and left for the weekend. When we came back it had rained and the poor little tree was underwater and dead. It only had around ten leaves when that happened. Of course apple trees seem to grown leaves faster than cacao. The whole tree was no more than six inches tall. My problem then was that I had put it in a glass bowl with dirt to grow in and left it outside. In southeast Texas it rains so often I should have known better. This time around well, it's still in a container without drainage but it's inside the office and will probably stay there for a while until it gets big enough to plant in the ground. At the new place we've moved to there are plenty of places I can plant it, I think. If I had planted that tree 21 years ago I'm pretty sure it would be producing pretty good by now. 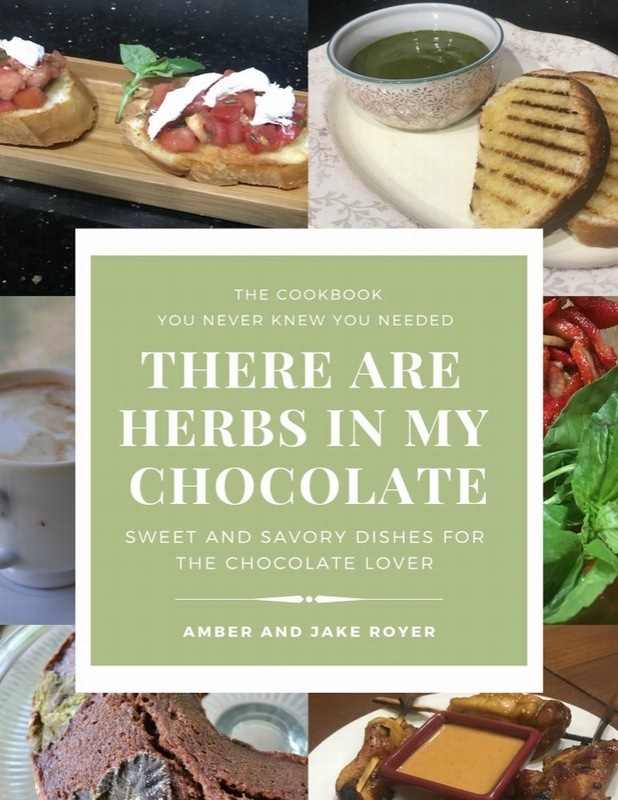 My wife and I are releasing the new expanded and revised version of There Are Herbs In My Chocolate, a cookbook we originally made for supplementing her lectures aboard Royal Caribbean cruises. Because even the Olympic athlete who was doing performances on stage had a workout video they were selling. We're happy to have added about 30 recipes and have given it an updated feel. We have included one of my favorites, a chocolate pear tart with sweet dough crust. The crust was a recipe handed down from my grandmother and, when I was growing up, was used only for special occasions. Of course I give ALL the correct ingredient amounts. The book is available for preorder on any of the sites listed here and it will be coming out on May 7th. We hope you are as excited to try some of the recipes, all tested by us (one recipe didn't make it into the book, it was just bad). 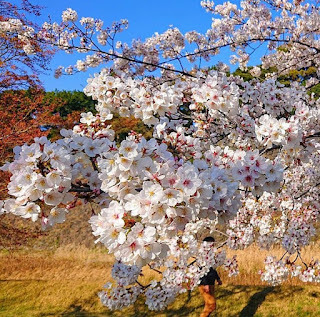 Our one trip to Japan was not during the cherry blossom season. Don't get me wrong, it was a great trip as many of the trees were already getting fall colors. Although we saw a lot of flowers, like the rose gardens at the Total Recreation Park Rose Garden (バラ園), blooms like these were no where to be seen. Some of our friends from over there have been taking a lot of pictures and posting them or sending them to us. At one point I sent a picture of what we get for a short time, the pear blossoms. They were politely impressed but it really doesn't compare in display or longevity. 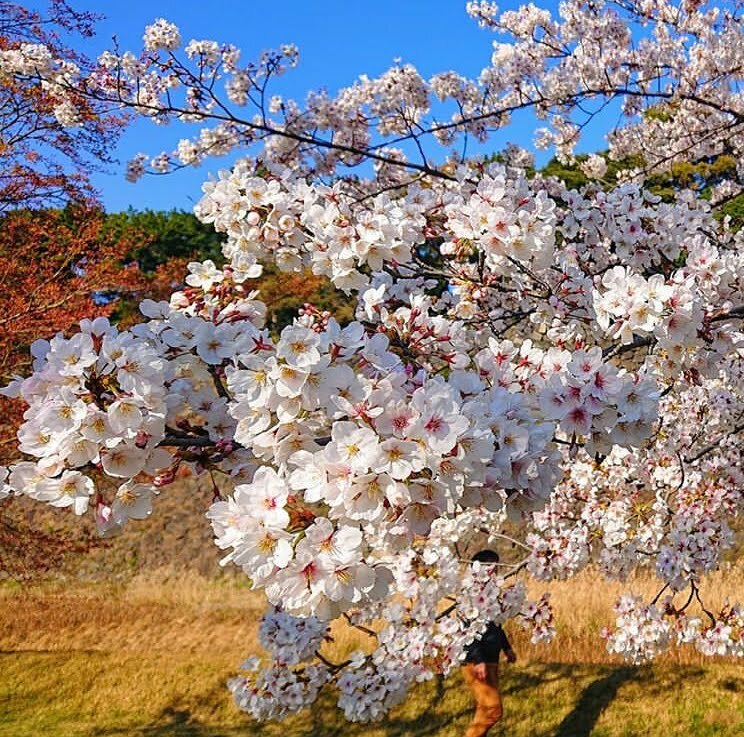 Maybe some day we'll be able to go see the cherry blossoms in person and really get the full effect of the season because I'm sure the pictures, although wonderful, don't do it justice. So we're moving apartments. The new place is a little smaller but the kitchen is way better. And there's still enough room in the living area to play VR. The outside area and the side study right by it though are the real draw though for growing things. Sure it looks out to the garages but there is a good bit of sun coming in and it can be open more or less a good bit of the time. Those days when you have the windows open and the outside shines in are the best. Seems we're only really getting rid of a desk and possibly a file cabinet. 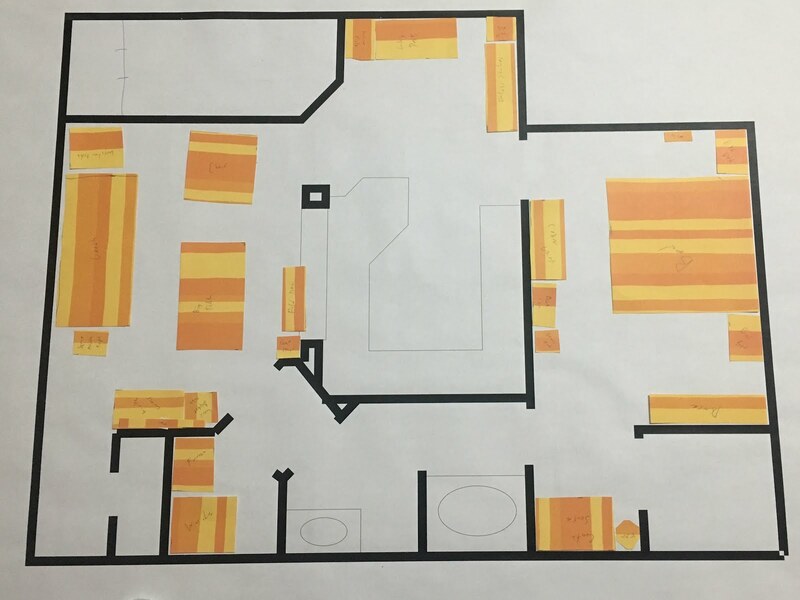 The floorplan showed another window on the far right wall of the bedroom but there isn't one. It also wasn't very well drawn to scale. Also thinking about getting a small chest freezer. Back when we got married, one of the first things we got was a large chest freezer and we had it for almost 20 years. It was great for freezing leftovers and being able to buy bulk items that needed freezing like meat. And we could make large batches of chili, soup, or such and have it handy for days we didn't feel like cooking. I think I've said this somewhere before but it's amazing how much like a city a leaf looks. You have the main highway down the middle of the leaf with collector streets merging at intervals and little neighborhood streets coming off of those. A leaf really does have the water and sewer system going on through the veins you can see. They do double duty though unlike a man made city where you'd better separate them or face a major disaster. Even the drainage, or rainwater, that hits the leaves will travel down these paths and end up flowing off of the point of the leaf. Trees that are more adapt to a rainforest environment even have a more pointed tip to the leaves to assist the water as it pulls together toward the tip and falls off of the leaf to minimize the weight, and thus potential damage, on the branches. Pine needles are really good at this. The pointy long leaves barely hold any water at all, dripping like nobody's business. We used to camp a lot and the piny woods of East Texas was a favorite. The smell of a pine forest after a summer rain is something you don't soon forget. A good leaf picture also makes a good desktop wallpaper. Not sure if this works real well since it's only taken with my iPhone, but it could be worse. I know I like green beans and I know I like dried beans. But I never thought to see if I like dried green bean seeds, which are of course dried beans. It takes longer to get them and you can get dried beans so cheaply in the store so It's probably why I never though to grow my own. Finding references to doing so was also not easy to come by but there are some. So instead of taking the green beans and eating the young pods, I'm going to be patient and wait for these guys to mature and make beans. Not sure yet if I want to make a bean soup or possibly try to do a white chili. One of our friends said they don't think they've ever had white pepper, although I'm sure they probably just didn't notice there was pepper in the food since it doesn't give it that distinct peppered look, for instance in alfredo sauce. Any way you look at it though I was going to make sure some of them dried anyway so in the end I'll just see how many beans it makes and make sure to save enough for later planting and eat the rest. So far it seems like you don't have to soak the beans for very long if you have to soak them at all and the flavor is supposed to be even better since they haven't really fully dried. Hopefully I'll get a good recipe I can share later. 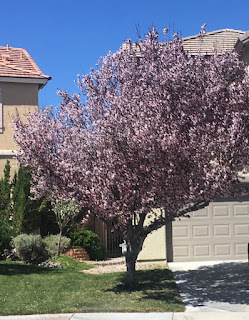 In the courtyard of the apartment there are these trees with big flashy pink flowers on them. After looking them up they seem to be some sort of magnolia tree, possibly the bloomy magnolia tree. I've only been used to the grand magnolia tree which grows everywhere in southeast Texas but not so much these. They really are a nice showy pink flower that I'm sure will all fall off in a week or so. There were already some petals on the ground and no new buds. This would be an interesting tree for landscaping but it's a very seasonal color for an area. I've seen some really nice colorful plantings at the Fort Worth botanic gardens. These were mostly anuals though, not trees, but I've heard of seasonal layouts that come back year after year and these trees are a perfect example of a usable tree. If you've lived in, or even visited, DFW for any real length of time, you've seen asian jasmine. It's everywhere. Any place someone doesn't want to maintain very well and is all by itself in a boxed area or even lining sidewalks, this stuff is used like a cure all. But it's far from it. Asian jasmine will take over areas before you know what happened. Sure you think it's nicely isolated by a five foot sidewalk, but no.... It will send roots under and vines over that sidewalk to reach the other side. And then it will just keep on growing. It's not as fast or invasive as kudzu or as entrenching as some bamboo but it's doing its best considering its size. So is it always a bad idea to grow asian jasmine? No, but you have to keep in mind what it is and the time it will take to keep it under control. I've seen it used very well around trees where grass won't grow and kept there with a beautiful lawn surrounding it. You just have to keep at it. That being said, if you do have lots of it growing and you want to replace it with say, a little garden. You have to more or less cut down a ways and pull up the roots, sifting the dirt as best as you can to make sure it doesn't pop up and choke out a once thriving tomato plant. The little beans have gone from cute to ready to eat, not that there enough of them right now to make a side dish. I'm going to wait until these guys get bigger and form viable seeds though so I can replant them later. This wasn't really for a crop of beans. It does show though that you can grow your own vegetables in your office cubicle even if you only have room for one pot. When I worked in Dallas I tried growing some plants in my cubicle and they did pretty good. One such plant was a sunflower. I don't think it would have produced well but it grew nicely in the little cup I was growing it in. They really do require full sun though to mature and make seeds. I also had a little bonsai tree. I don't recall which variety it was but it lasted nearly a year. Lastly that was where I started my first lemon tree which lived in a pot for a good long while. You can see an old post here. Here's a favorite flower of mine. Back in southwest Louisiana these things grew everywhere. In every field or yard that wasn't really well maintained these guys would spring up and make a nuisance of themselves. They were pretty to look at though and so I really liked them. My mom specifically told me not to eat them though or I'd have an upset stomach. I of course didn't eat them but I did decide one day that they would make a great flower bouquet for mom. So I went around the neighborhood and picked what seemed at the time to be thousands of them although it was probably closer to twenty. I could tell she wasn't really thrilled to get them but she still thanked me for the flowers and put them in a jar of water so they would stay as long as they could after being picked.. I'm sure some of them were already wilting and I soon forgot about them. For all I know she tossed them an hour later after I'd gone back outside to play. Something similar really did happen with a pair of earrings I found in a muddy drainage ditch. They were plastic hoops and she thoroughly cleaned them before wearing them once and then they were never seen again. I remember asking about them though but don't remember the reply. Probably something like, "Oh, they're in the jewelry box." 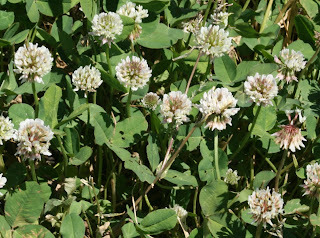 When I was a kid I used to make chains out of white clover flowers. I'd just go out to the school yard and sit in a field of them and make as long of a chain as I'd like or at least as long of a chain as I could make before dinner was ready and I had to go inside to eat. This has to be one of the few plants I never thought about eating though. Bees sure do like it and it's one of the more popular honey flavors but to look at it it doesn't seem like a food stuff. Like most greens you find in a field it's bitter but it's been used to make teas and can be put into salads. All of the plant is edible and the flowers make a nice tea. 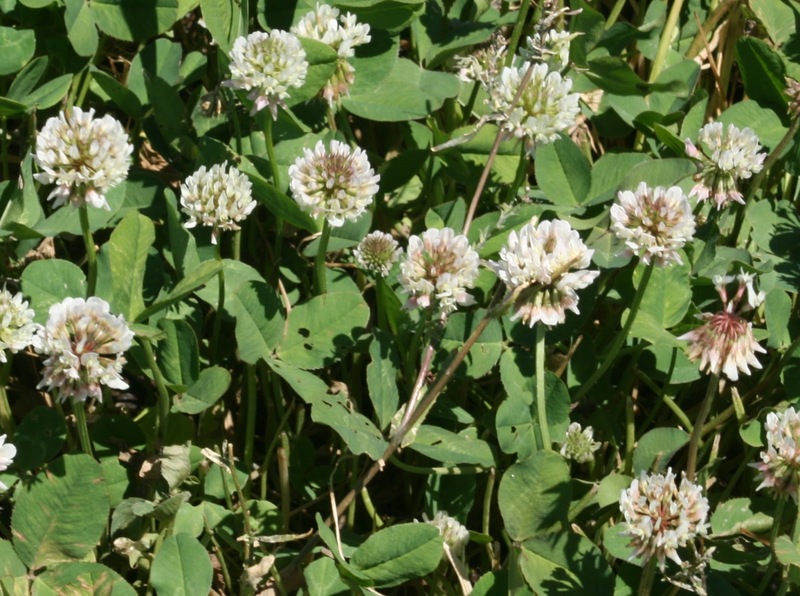 Fair warning though, make sure you wash them just in case the wildlife has found the patch of clover first. You never know what happens out there. Apparently around the same time I was taking pictures in Las Vegas, our friend, Monica, was taking pictures just south of Dallas at Cedar Ridge Preserve. 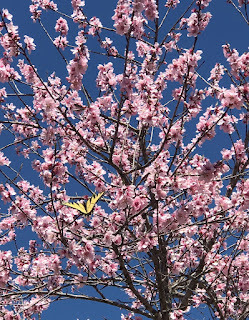 Where I only got a picture of a plum tree she got a nice picture of a western tiger swallowtail. Granted, I didn't see any butterflies at all in Vegas. 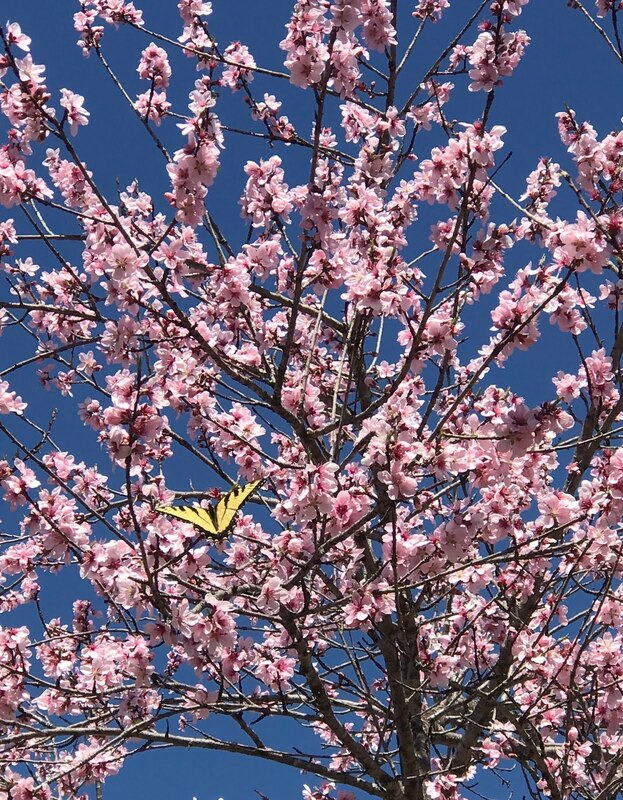 I'm glad to see the butterflies are starting to show up around here already though. It should be a nice spring soon. While in Las Vegas we were able to do a little driving around. We were told that if you want anything to grow there you have to water it yourself and typically trees don't grow on their own. 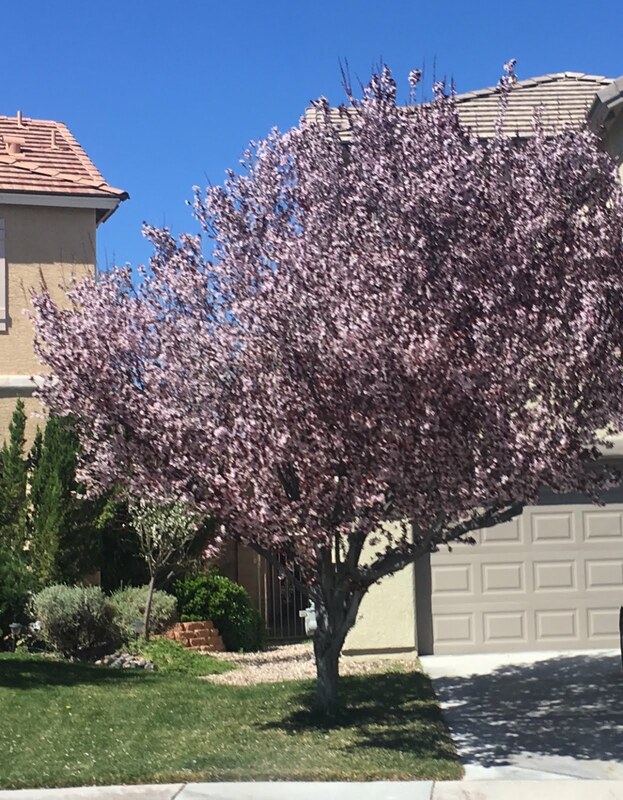 This lovely plum tree was a great example of someone taking good care of their trees. It's bloomed out beautifully and, although one of the best in show, it wasn't the only plum tree around. People in Vegas really like their area and are working hard to make it even nicer. I was surprised to find out that in Henderson, just outside of Vegas, they didn't have a recycling program. With how neat and clean most of the places I saw were, I just expected recycling went right along with it. Speaking of flowering out though, when I got back to my office today the bean plants had several beans growing. I guess I didn't need to hand pollinate after all. Still it never hurts to try. Might get an extra bean or two that way. You can't tell from this picture but for Spanish speakers you probably can already tell that the name of this plant means "little apple". It didn't click in my head immediately but after looking up some information about this plant it was obvious I spelled it right. 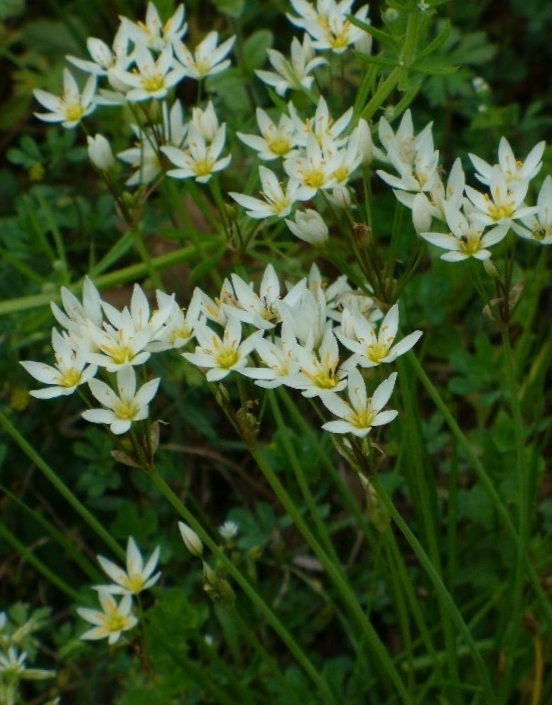 This particular plant was a shrub although there are many varieties ranging from ground cover to small trees. Many parts of this plants caught my attention as we hiked around Red Rock Canyon just outside of Las Vegas. The leaves were thicker than I would have expected. You can see the thick edges in the picture. The flower clusters reminded me more of the agave plants. The red bark though caught my attention first. I could see it from a good distance away and is what drew me over to the bush in the first place. It's not as visible here but it's a smooth dark red. I can see why it has been used in decorative wood objects for centuries. The plants range in hardiness depending on the cultivar but can be grown in most of the country as long as you keep it's watering requirements in mind. We found this I a very rocky area that drains fast. They're used to dry areas. Propagation is not necessarily easy. The seeds don't like to germinate unless specific conditions prepare them first. This sounds like the issue I have with lemon seeds. 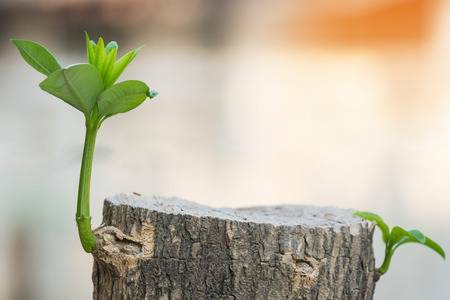 Getting the outer shell off of the seed first seems the easiest way to sprout. Some of these plants are fire resistant and can come back even after several fires. This type though will make a burl at the base of the plant and resprout from it though I doubt anyone gets a plant for their homes on this basis. Out at Red Rock Canyon a couple days ago, climbing on some of the huge rocks out there. Lots of the colorful lichens grow on these rocks (like around the moss lichen) but the moss lichen was the fuzziest and neatest looking. I had originally been looking for jelly lichen but I'm pretty sure I was just looking in the wrong places. I'm really not fit enough at the moment to get to some of the places I probably should have been looking in. Amer was a little nervous where I had been taking pictures. She said it looked like I was edging down the edge of a cliff for a while. Really I was just a few feet higher than she was at and by a slightly steeper slope but no worry of falling to my doom really. No worry to all those who are concerned about preservation though. I only took pictures and made sure i didn't stomp on anything growing on the rocks. So, our office has a mostly unused courtyard. It's overgrown with jasmine, as you can see, and rarely even cleaned out. There is a drain in the middle of it so it doesn't flood but currently it's covered in leaves so I'm not sure how effective it really is. My wife has heard me talk about the little courtyard and decided recently that it might be nice to do a little gardening in it. The area shown really is the best spot in it for gardening but it'd be a lot of work to get it in a state that you could grow anything there. We're already pretty busy people with her writing events going on throughout the spring and summer but we'll see. First I'd have to ask my boss anyway but I think there's a pretty good chance he'd not mind as long as it really was kept up. The only real pests would be the squirrels. So as long as I plant something they don't mess with I should be ok there. It's about 5 feet wide there and a bit longer so I can see something growing pretty good. I'd have to figure out how to water it though. And keep the water from getting into the building since it's up against the windows. Maybe a strip of daylilies there? This cute little green bean is just the start of my green bean harvest this year. Well maybe not quite what you'd be able to call a harvest but it is at least a bean. I hand pollinated this flower when it was just opening and apparently I did a half way ok job doing it. There is another smaller one but it was a lot harder to take a picture of so this is the one I got. There are a lot of flowers at the moment though so I expect there to be a lot more beans as well. hand pollinating is one way to do this. Not sure if the gnats will do anything with the flowers or not but I really doubt it. 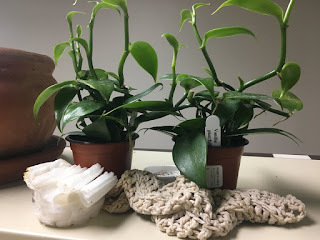 I was looking at the vanilla orchids as well today and I believe they are quite a bit larger than when I got them. I still haven't taken the time to get them something big enough but light weight enough for them to climb up. That branch is still leaning against the wall but it really is too heavy to work well at the moment. 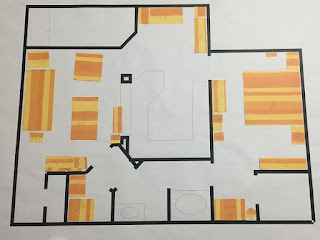 I have to cut it up or maybe even split it so that it can be used and not be unwieldy if it needs moving. The Eastern Redbud tree is a nice addition to a spring view. The red/purple flowers bloom out all over it. This year it's a bit early due to quite a few unseasonally warm days. This one grows right outside our window. Of course this is a picture of the red buds with a dark blue sky as a perfect contrast. The sun rays were quite an accident but really does add an interesting accent to the composition. This makes me miss the fig tree we used to have back at the house. It would have also sprouted out by now. Of course all of the flowers would probably have fallen off due to the hail storm we had this morning. It really only ever had one good year of figs. That is to say only one year we got more that five figs the entire year. Again, not having a house really does distance you a bit from all of the problems that come about due to critters, weather, and the unexpected. I get to just sit back and enjoy the view while someone else worries about how it got there. This cute little girl was in the courtyard at work the other day. Started me thinking about all the animals we see around the city as we're doing whatever really important thing it is we do and just how many we don't really see because of it. 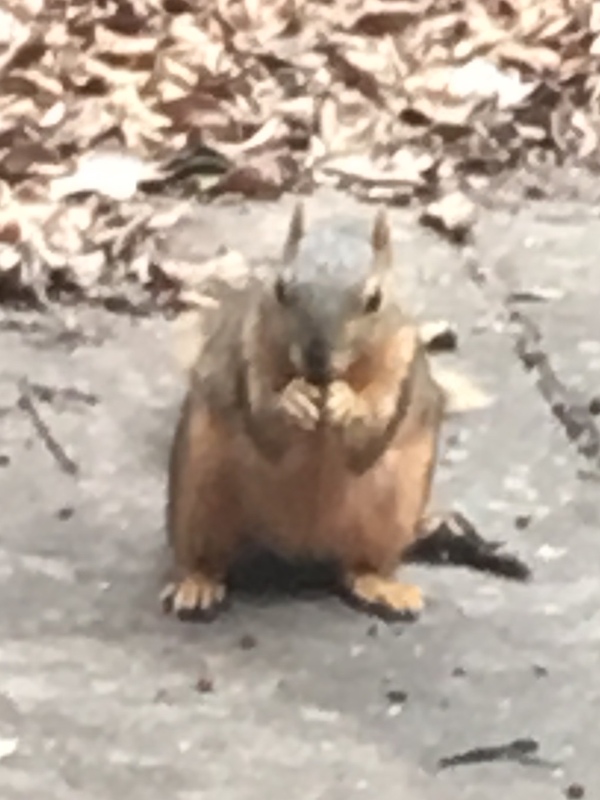 There's another squirrel, a boy squirrel, a coworker calls Fred. He, the squirrel not the coworker, likes to sit up on one of the branches of one of the trees in the courtyard and flop on his back to nap. It's like he thinks he owns the place. Some of the other critters around include the rabbits outside the apartment. We've seen several of them at a time so you know there's a lot of them hidden away. A friend of ours has a hawk that likes to perch outside one of the office windows and either rest or, on a good day, have lunch. A less popular critter is the skunk who seems to live under the walkway that leads up to the back door of our office. You rarely see him though since they really do prefer to avoid interaction with people rather than spray them. 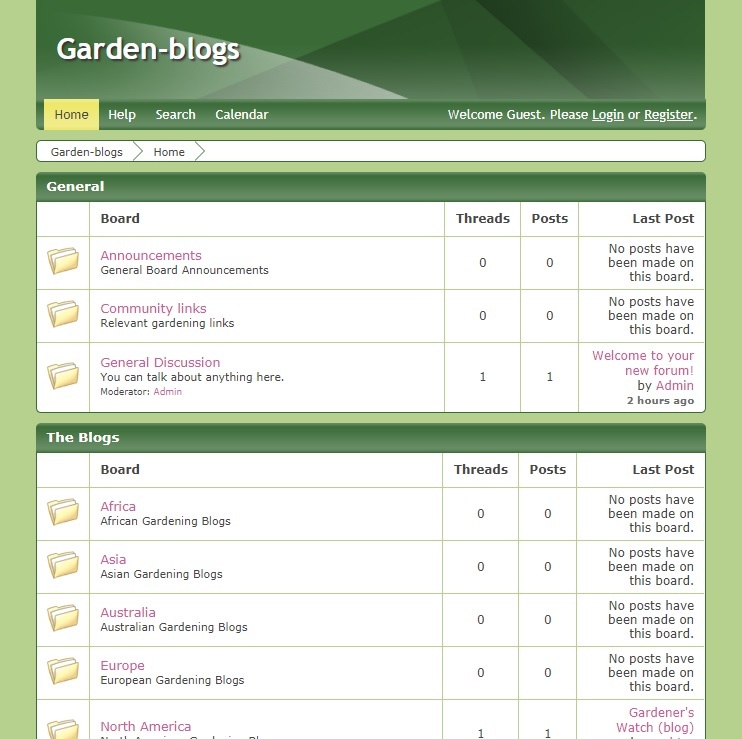 The Garden Blog Forum is now up and running! I hope to convince other garden bloggers to join up and share their blog links. At some point I'm going to try to get a google map going with pins showing where the different garden blogs are located. I know this is a far cry from Blotanical but I figured something is better than nothing. Of course there's a suggestion area and any suggestions are totally welcome. I already started it off with my own login and post (here in Texas). If you think any more regionality is needed we can look into how that might better be handled. Right now it's pretty vague and needs a bit of work but you have to start somewhere. I was really disappointed with some of the sites out there who didn't really care what kind of blog you really had and were just after your money. My blog is not a money maker. I plan to reach out to some of the blogs I already know might want to at least get the word out more about their blogs and get a bit of conversation going. Hopefully I'll find some new gems out there with something interesting to say and words of wisdom to impart. EDIT: This forum has been closed due to 0 activity apart from spammers. If you know of any forums for garden bloggers I’d love to hear about them in the comments. The first bean flower to actually open. It actually isn't very well formed and it's the only one so far but at least it feels promising. There are several others forming so eventually I should be able to hand pollinate them and get some beans before it's even very warm outside. If nothing else the flowers are pretty. A blast of white (not snow) in the office among all the green. My first flower that I really tried to grow was the daylily. It was a purple and orange mix. I tried to bring it with me but planted it in a poor spot and it didn't survive but for a few years. I thought it had just not flowered but when I went to dig it up for moving, after we sold the house, it was gone. We had several other daylillies in the backyard at different spots some flowering and others too shaded to do anything. They're another plant that's easy to grow for beginning gardeners. My boss Art came by asking about the large branch in my cubicle. Ok, it is a little strange to have a branch against the wall but after explaining what I was going to do with it he seemed fine. Of course I can't leave it like it is but for the time being it's ok. The top of my cubicle is really starting to take on a greenish hue though. It's kinds nice to have a little green in my area. Especially on these cold winter days it's good to be reminded that things are still growing. It brightens up the day. Still need to do a little tree separation though. One of my coworkers still hasn't brought a pot for transplanting yet but again came by and looked at the plants and was like, "Oh yeah, I need to bring a pot..." We'll see if this actually happens or not. The other transplanted trees, you can kind of see in the background on the left, are doing just fine still. Better than the left pot for sure. But I think the left pot is starting to pick up well. Lots of little leaves coming. The bean plants on the other hand, while they have leaves, aren't fully flowering. The flower starts to form and then just dies off. Maybe while I'm at Vegas it'll try again to flower and make some beans. 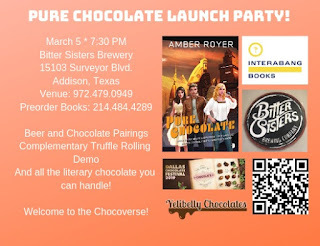 Tonight at 7:30 at Bitter Sisters Brewery in Addison, Texas, my wife is having her book party for her second novel in the Chocoverse series, Pure Chocolate. She'll be there reading an excerpt from her novel as well as signing copies of her book which can be preordered through Interabang Books. Yelibelly Chocolates will also be out there doing a hands on truffle rolling demonstration and helping to put together a chocolate and beer pairing, available at the bar. Top it off with some free cake and you're sure to have a great time. Of course it's more a centerpiece than a cake but we'll eat it eventually. 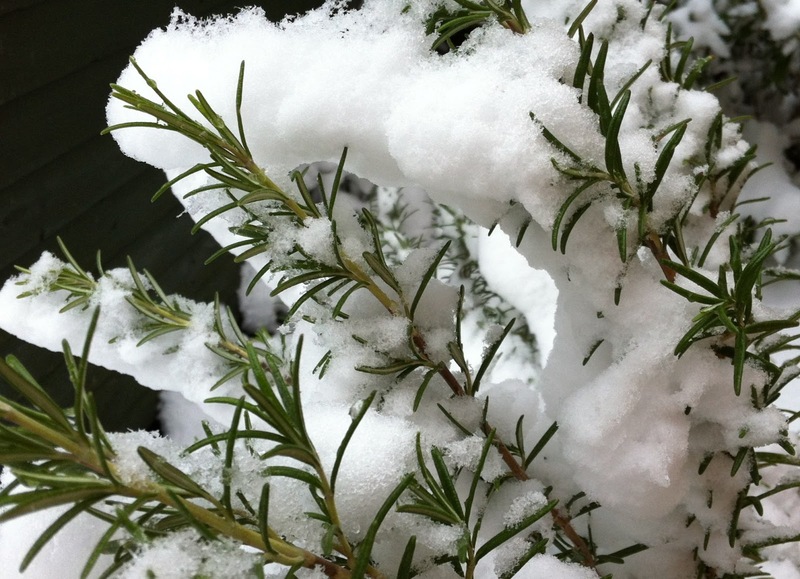 We all probably have our favorite plants that are cold hardy or at least keep coming back year after year. For example, the rosemary pictured here just laughs off a bit of snow and keeps right on growing. Sometimes it'll even bloom soon after as if to say, "Are we ready for spring?" One of my favorite plants growing up, living on the Texas coast, was the azalea bush. Every spring they would bloom around the city and you knew it was going to be so hot in a few weeks that you would soon rather sit in front of your tv until Fall than go out and do anything. But for those few weeks, outside was the place to be. A close second was of course the honeysuckle but that's a different post. The point of this though is that even up here in the Dallas area there are varieties of azalea that will grow just fine up here and give that same sense of dread that summer is coming. But with the addition of the azalea, those few weeks of spring will be so worth it. It's unfortunate that not a lot of places grow azaleas as landscaping shrubs though. Part of that is probably due to the heat we experience here. Keeping them shaded and watered enough during the hottest part of summer is probably more trouble than it's worth. On the coast it really doesn't get as hot for as long and when it does it at least has moisture along with it. Typically we think of reds and oranges as fall colors. Here though these colors represent new growth. The new leaves start out fairly red and start growing pointed downward. Rather quickly though they grow to a full size leaf and go from red to orange to yellow and finally green. Even after they are done growing they aren't at their final green color. This can take several more days of development. 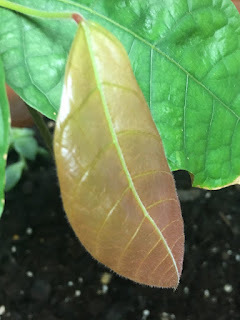 You can see here on this leaf the red node at it's connection point to the leaf stem. This plant hadn't had these before but may fade as time goes on. It's already a bit lighter than it was when it started. New red leaves aren't an unusual sight though. Look around this coming spring at the trees as they begin to leaf out and you'll notice that many trees start with red or orange leaves that turn green as spring continues on. Right now the pear trees are blooming and look white, not quite rivaling the cherry blossom season but still a sight to see. Unfortunately the cold snap that's coming may well knock all of those blossoms off. with icy rain. This coming Tuesday night at 7:30 at Bitter Sisters Brewery in Addison, Texas, my wife is having her book party for her second novel in the Chocoverse series, Pure Chocolate. Top it off with some free cake and you're sure to have a great time. So we went all around Addison today and placed post card sized fliers about Amber's upcoming book launch party, signing, and chocolate related event. One of the places we stopped at was 84 Point Coffee off of Midway Road. At first I though the plant must be a fake since it looked pretty unbelievable and it looked like it was just put on top of some coffee beans. After looking around for a little bit though, as Amber took pictures of her coffee, the flier, and bookmarks we had with us, I began to realize that the rest of the plants seemed to be real enough. Then I saw bits of it had turned brown and there were marks on it that wouldn't have be put on a fake plant even if they were trying to make it look authentic. After a quick search I figure it's most likely a variety of haworthia, probably herbacea. Yeah, I've never heard of such a thing before either but it seems to be related to aloe plants. 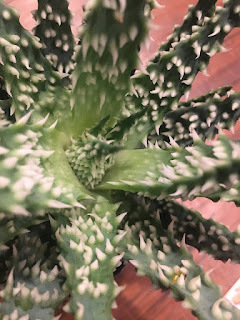 Those spikes feel more like rubber, thus my initial thought that the plant was probably a fake. I had a short conversation with a coworker recently about how terrible fake plants are in an office. They do the opposite of what real plants do. They sit there, collect dust, and smell funny. She had been in an office where the office manager just loved to get more and more fake plants to put everywhere. When they finally closed that office the fake plants were so dusty you could see the clouds they gave off as they were trying to get rid of them. It wasn't good. 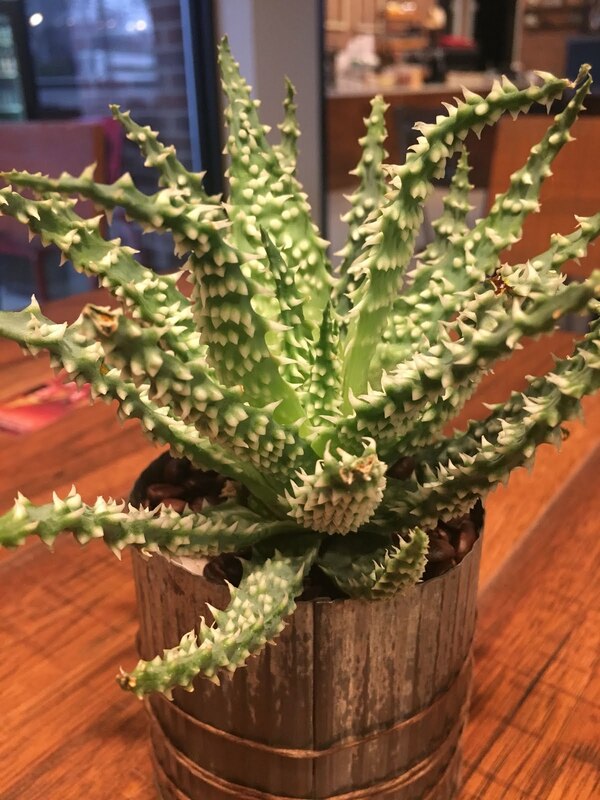 This is one of many plants I will probably never get but it was neat to look at it for a while sitting in a coffee shop. Go get some coffee and see if you agree. Really not sure why this happens still. Red (named because all the leaf nodes were red from the start) I figured was just how that variety grew. But now I'm wondering if it's how it's growing instead of what is growing. This picture is of one of the cacao trees that traveled over to the next cubical to be cared for. Only this last leaf so far has the distinct red nodes. The rest of the leaves are just plain green. Maybe a little darker at those points but certainly not a different color. As you can see though the traveling plants are doing just fine as well. New leaves coming in all the time and a nice color to them. There is no gnat colony over there though so I guess that's a plus as far as worrying about them. I've been thinking about getting this one taken care of. They're not really bothering me but I don't want them to become an office nuisance. The green bean plants are finally flowering. I thought it was making some flowers earlier but they turned out to be new green shoots from the main stalk. In a day or so I should be able to pollinate the flowers and get the beans to start forming. This one is very much a vining variety. It keeps sprawling out. The other beans from the same packet though seem to be growing upright. Not sure exactly what this means about my beans but so far none of my plants seem to be uniform in variety. The mister I ordered to help out the orchids never arrived and the seller isn't responding to messages. So it's back to the search for a mister that will help keep the humidity up for these guys. Fortunately Amazon is probably going to get me a refund of the cost since there was a problem. We'll see if it actually happens though, not finalized. Thinking of planting a low ground cover in the pots at some point but not sure what to plant. The trees of course aren't quite ready for that anyway but it's still something I want to think about and plan. A low growing shade loving herb might be good since it's going to be indoors. Maybe thyme or mint? Any suggestions are welcome. This little guy helps keep the fungus gnat problem under control. Yeah they're still flying around a little but they're hardly noticeable any more. He eats several a day and they try their best to keep up with what they lost. Here he's hiding under one of the vanilla leaves. His webs crosses between the pots and he goes out whenever something gets caught in his web. So far no one is complaining about the gnats or the spider so I guess it's all working out for the best. Some people would probably tell you to get rid of the spider, the gnats, and the fungus but a little fungus is good for plants and as long as the spider can keep the gnat population under control there shouldn't be enough larvae to be damaging the plants. The plants seem happy and there's no signs of stunted growth. So I don't really want to spend $80 on a branch for my vanilla to climb. But how do you get a branch from the wild and make sure it isn't infested with critters or disease? The best way is to dry it out. If you have a branch/stick that can fit in your oven then great! Toss that into your oven around 250°F for an hour or so and you're good to go. Be careful though since that is a VERY general idea. Your exact timing and even temperature can vary widely, as much as 100° and/or half an hour. A better rule is to check density of your wood. Denser wood will do with a low temperature for longer while lighter wood shouldn't take so long. Of course if you start to see a little smoke starting then take it out immediately. You don't want your oven catching fire. As we all know, wood burns. Alternately you can use a handheld steamer to steam the outside, effectively cooking the outside of the stick. This doesn't take care of the inside though. For small sticks you can boil them in a large pot for hours. This should get rid of any problems but then you have the problem of drying it so you might as well just have put it in the oven. I don't have a seven foot oven or a huge cauldron though and no steamer and so I have to go the chemical and scrubbing route. This branch of an oak already has some house guests holding on. and a few bugs living under the bark. First off I used a bug killer and am letting it sit for a few days. Once that's nice and aired for a while I'm going to douse it with rubbing alcohol until nice and saturated. Of course I'll be keeping it away from any ignition sources for a while until it all evaporates away but this should kill or drive off anything that the bug spray didn't. Then after a nice scrubbing with a bristle or wire brush it should be ready for use. Restarting this blog feels just like this, a little twig growing out of a once seemingly dead tree. I forget exactly why this blog became inactive for so long but I'm hoping people will start to come back, If nothing else to see the plants growing. Really, is there any other reason to come see? This picture reminds me of when we had a house and we were trying to kill off the crepe myrtle bushes/trees. They wouldn't die. They just kept coming back like this little guy but with much more gusto. I still don't have time, much less anything really neat to show or say, to put up a post every day, but I'm at least going to try to keep the posts interesting and make sure I'm not just rambling on about nothing. Of course there should always be a picture, like this one, even if I didn't necessarily take it myself. Brought the little vanilla plants to the front toward the light. I had left them behind it so that the little spider wouldn't be disturbed but they were not looking like they liked so much shade especially since they were indoors anyway. The white things in front are the cut up bottles with water and paper towels in them. Still having to change them out every few days so that they don't breed mold. They already seem to be doing a little better. In front of this, but out of the picture, is the other pot. I raised it up too a couple feet to be closer to the light. It went from floor to on top of two boxes to on top of a filing cabinet and two boxes. The leaves are starting to pick up again. It's growth had been stunted due to lack of light. The bean plant you see in the upper right of this photo is starting to form flowers already. I should have beans in a few weeks. Okay, maybe two or three beans but that's still more than one. There's a little green shoot coming off of where the cotyledons used to be attached. 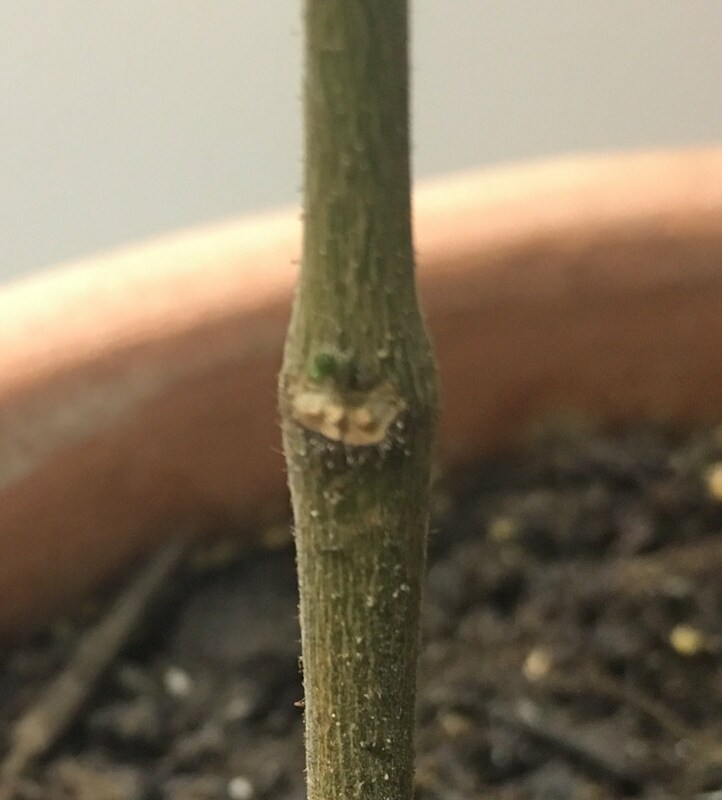 Hopefully this is where the first branches will form from. As you can see, the trunk is already starting to look woody. I will be transplanting them yet again soon so that each tree will have it's own pot to grow in. This might mean getting some new bigger pots too since I doubt at least one of the pots is really big enough to hold a tree in. It looked fine when the tree was just sprouting but one of the leaves alone is taller than the pot is. I'd guess that that's a sign that the pot is a little too small for root comfort. Cacao trees have a tap root. Not quite what you think of like a carrot or anything but it does shoot a thick root down and spread out a system from there, as well as some surface roots. It looks like a smaller version of the top of the tree. In a mature tree they can be several feet underground. Of course in a potted situation they can only go as far as the bottom of the pot so I'll need to eventually need at least a two foot deep pot to keep it happy. I haven't seen anything that big for a reasonable price yet but I'll have to keep looking. Plant identification by leaf is a common practice. There are websites out there (usually by geography) that can help identify a plant by shape, type, texture, and such of a leaf, like this one at Texas A&M. I guess I never paid a lot of attention to the leaves of a bean plant before but the initial leaves just didn't look like a bean plant to me. It so happens that these are primary leaves that get the plant growing quickly and don't match the rest of the leaves it will produce throughout the rest of the growing cycle. I think I already see some leaves forming at the base of some of the leaf branches. It won't be long before they open and start to make beans. One of my favorite things about bean plants is that they grow so fast and you can see results without waiting too long. The cacao, just visible on the right, takes a minimum of 4 years for fruit to form but more likely 7-8 years in these less than ideal conditions. They are still putting out leaves though. If you've been around long enough to try leek soup or pasta with leeks then you've probably also always been told that you just toss the tops in either water to make stock or the compost bin to make dirt. They're simply to tough to eat. That's never stopped people before. Coq a Vin recipes took the same challenge with old chickens and made a tough old bird tasty again. You can do the same thing with leeks. One easy method for using these nutritious tops is to just make a soup and puree it until the bits are too small to even need chewing. 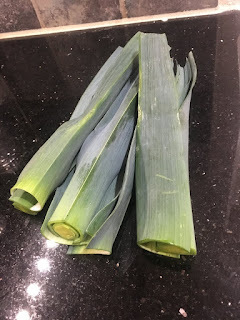 Another as mentioned in The Spruce Eats is to cook them long and low as you would any though food to make it tender as in these Buttered Leeks. What are your favorite ways to use leeks? Beets have to be one of my favorite vegetables as you can tell from this previous post. At salad bars, I don't really consider it a very good selection if they don't have them. This time around I would like to show off how well it goes in a salad though instead of how well it grows around here. Not only does it give a great contrast of color but it also helps to mellow some of the other flavors you might have in a salad. If you don't want a mostly red salad though you need to make sure you rinse and thoroughly dry the beets after you cut them up but before you put them in the salad. Otherwise it won't look nearly so appetizing. 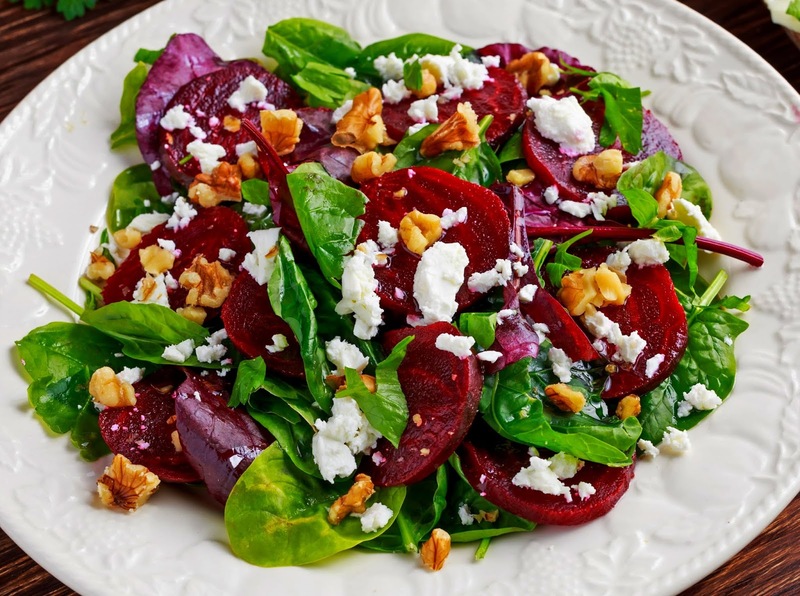 What are some of your favorite ingredients that you like to put into your salads? Temperatures here reached 80° today. Not shabby for an early February day. Perfect for getting these guys out for some sum. Usually they prefer a more shaded area but the angle of the sun in February isn't too bad. The sun being lower in the sky will hopefully keep the plants from getting too affected by the sun's intensity, while at the same time getting some much needed light during winter months. The sunlight finally came around the building. It had been in the shade most of the day. The bean plants are loving the sunlight as well. They've really perked up and have grown noticeably since this morning. Tomorrow is also supposed to be nice but overcast. The temperatures should still be warm enough for a day out though. Then it's back inside until April unless we get any more of these unseasonably nice days. Aloe plants really prefer bright, sunny, warm places to grow. 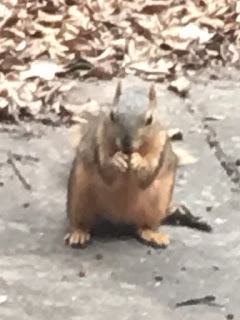 They do however tolerate pretty well extended periods of inside, dark, wintery periods from which they will "spring" back from in the spring when they can go back outside after the threat of freezing has past. I know how hardy they can be because I thoroughly neglected several of these guys and it still took years for them to actually die. Just one more plant that you should be able to give any friend and not be too worried even if their thumbs are brown. My wife had a group over today for marketing and someone brought lox. I didn't really know before what that was but it went really well on the bagels they had during lunch. I also had a Pokka Milk Coffee to go with it. What I noticed here though were the oranges. Often when we go to the store we want that perfect piece of fruit or cut of meat or what have you. My grandpa tole me once that grocery stores won't even buy fruit if it doesn't look nice even if it's perfectly good to eat. These oranges are a good example of fruit that has a blemish but is otherwise fine. The oranges he had growing on the tree often had even more dark spots but there was nothing wrong with them. Next time you're at the store take a look at how the fruit looks and think about how that affects what you buy. Oh, and pick up some lox, they're tasty. Apparently I should have waited longer to see how humid it was getting. The water wickers have been there for over a week but the hygrometer I just put there a few hours earlier. Checking it later that day it had gotten to a little over 60% now it's a whopping 70%. No wonder the orchids like it there. It' a very localized humidity but that's exactly what they need. Of course I'll need to change them out every week so they don't grow mold but that's a small price to pay to keep these babies happy. I do think I'll be adding a third though. Although 70% is on the high side of normal, it's on the low side of what orchids prefer. 85% would be a sweet percent to be able to get to and really get these guys comfortable. The humidity is still creeping up. It says 71 now.